970673 Special Elements for ROBO Technology Set is a Service Packs set released in 2002 containing 75 pieces. 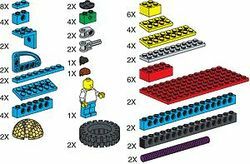 The set includes one minifigure and male and female hair pieces, along with other various bricks, most with holes in them for other axles and bricks to go through. Facts about "970673 Special Elements for ROBO Technology Set"
This page was last edited on 9 January 2016, at 22:53.